James Simpson-Daniel “Sinbad” played wing or centre for Gloucester Rugby from 2001 to 2013, making 274 appearances and scoring 120 tries. He scored 21 of his tries in the 41 Heineken cup games that he played for the club and was the club’s leading try scorer on five occasions. A favourite with the Kingsholm crowd, Sinbad was that rarity in the professional game – a one club man. His low centre of gravity, beautiful balance and keen rugby brain made him one of the all-time great wingers, the scorer or instigator of spectacular tries, but his career was sadly blighted by illness and injury and he only gained ten caps for England. 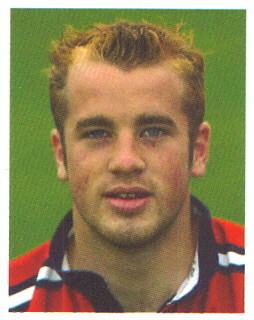 James David Simpson-Daniel was born on 30 May 1982 in Stockton on Tees. He learned his rugby at Red House School & Sedburgh School in the Yorkshire Dales, which has produced a number of top rugby union players including Will Greenwood, Will Carling and also Phil Dowson, whom he played alongside in the same school XV. While at the school, he represented Yorkshire and the North East at Under 18 level. While his schoolmates were attending university open days, Sinbad was visiting professional rugby union clubs. He eventually chose Gloucester Rugby. His 1st XV debut was at Franklins Gardens, Northampton in December 2000, when at the tender age of eighteen he came off the bench to substitute for Jason Little. In his second game against Rotherham in March that season, he came off the bench again after 25 minutes and scored a superb individual try. 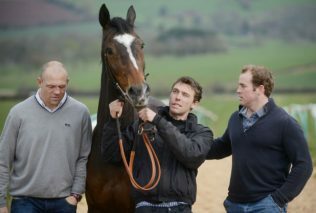 His Gloucester career was launched. He went on to start in Gloucester’s defeat by Leicester at Watford in April, their only Heineken Cup semi-final appearance to date. When Jonah Lomu is named today to play on the left wing for the Barbarians on Sunday, the question that will doubtless spring to his lips is: Who is James Simpson-Daniel? James Simpson-Daniel, giving away more than six inches and six stone to Lomu, produced one of the most audacious pieces of skill you will see on a rugby field. He left Percy Montgomery for dead after a dummy scissors with Phil Christophers……before beating Lomu so comprehensively down the right touchline that he left the big man flapping at thin air. He still had to beat one of the greatest full backs of the modern era, Christian Cullen, to score in the corner. He was chosen two days later for England’s summer tour of Argentina but had to withdraw due to a foot injury. This merely delayed his international debut, which he made against New Zealand in November 2002. He played in the second Autumn international against Australia but was then diagnosed with glandular fever and missed the South Africa test. Fit again in January, Sinbad played for England against Italy in the Six Nations at Twickenham, scoring his first international try. For Gloucester, he took part in both the Powergen Cup Final victory over Northampton in which he scored two tries and the Zurich Premiership Final defeat by Wasps. He was selected for England’s pre-World Cup 2003 tour of Australia and New Zealand, but was then one of six players who were flown from Wellington to Vancouver to bolster the England A squad for the inaugural Churchill Cup. England won the cup and he went on to play in the second of two matches between England A (as Churchill Cup winners) and Japan in Tokyo, scoring a try. Returning home, he started for England in their 43-9 defeat of Wales in Cardiff in a World Cup warm-up game on August 21 but missed selection to the final 30 for World Cup 2003 because of a back problem. Unluckily, injury once again prevented him from playing a part in the 2004 Autumn series in November and he missed further game time for the build up to the 2005 Six Nations. He was picked in the centre for England’s final 2005 Autumn test against Samoa but a hip injury forced him off at half-time. 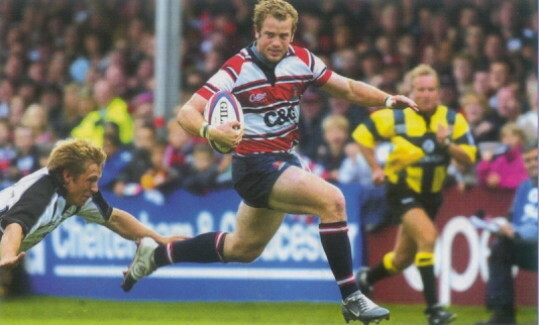 A fine 2005-06 season for Gloucester, in which he scored 18 tries in 24 games, scoring a try in Gloucester’s epic European Challenge Cup win over London Irish in the final at the Stoop, led to his making the squad for England’s tour of Australia. He scored two tries in their win over the Barbarians on 28 May but suffered a dead leg midweek during training, and as a result missed both tests, in which England were resoundingly beaten. Once more, he was beset by bad luck and fractured his collarbone in a pre-season match for Gloucester Rugby, which greatly reduced his chances of playing in the autumn tests. He was recalled to the England squad for the 2007 Summer Tour of South Africa, alongside club colleagues Andy Hazell, Nick Wood, Iain Balshaw, Anthony Allen and Alex Brown. Coming on as a replacement for Balshaw in the first test at Bloemfontein, he scored England’s only try of the match, but then fell prey to the illness which afflicted many of the England players on that tour. The Bloemfontein test was to be his last international. 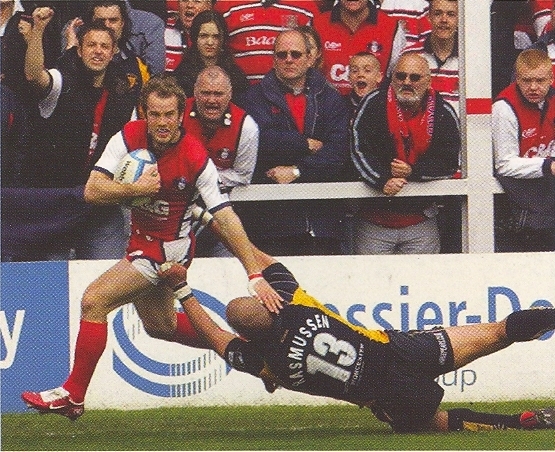 After a series of marvellous performances for Gloucester throughout the 2007–08 season, Simpson-Daniel was named Guinness Premiership Player of The Season beating Olly Barkley and teammate Akapusi Qera. He joined the England Saxons squad in Italy in February and was recalled into the full England squad for the 6 Nations international against Scotland on March 8, but did not play. Sinbad continued to dazzle the Kingsholm crowd over the next three seasons and his consistent brilliance could not be entirely overlooked by the England management. Still on the fringes of international selection, he was chosen to be part of the 2011 Rugby World Cup training squad, but on 1 August was one of five players released by manager Martin Johnson. After missing a large part of the 2012-13 season due to shoulder surgery, he returned to Gloucester colours in autumn 2013 and was playing as well as ever when he dislocated and fractured an ankle while playing against Newcastle Falcons in an LV Cup match at Kingsholm in November. He signed a further two year contract with Gloucester in January 2014 and there was every confidence that he would play again, but in the end he lost his fight to regain his fitness and on September 2 2014, announced his retirement from professional rugby.